The counterpoint to what? Good question. I wanted to talk about some personal experiences with communications technologies. Since the sentiments in this article may appear to contradict ideas I have shared previously – taking more of an analyst, rather than a consumer point of view – I thought I would present them as a “counterpoint”. Frequently, nascent technologies promise to improve the way we live and work. But at the early stages, both businesses and individuals tend to experience more challenges than benefits. I work out of a home office, like many other professionals today. Organizations are becoming increasingly virtual and IT managers are struggling to deliver reliable, secure and cost-effective communications to their growing remote workforce. In fact, many technological advancements – such as enterprise mobility, unified communications and SaaS/cloud-based communications, to name a few – are touted as particularly appropriate for mobile and geographically dispersed users. But remote workers frequently face issues that negatively impact their ability to leverage the full potential of these advanced technologies. UC and software-based communications provide a cost-effective and convenient communications solution for remote workers. COUNTERPOINT: At home, I have a regular POTS line, as well as a Cisco IP Communicator client on my laptop. I am glad I have the Cisco client because it allows me to call home when travelling or call an international number from home – free of charge to me. However, the few times I have tried to use it to attend an audio conference or make a critical business call, the quality turned out to be so poor that I had to switch to the POTS line or my cell phone. There are several “weak links” in this scenario and the soft client is just one. It may be the quality of my Internet connection. I have a DSL line (I believe 4 Mbps downstream and 1 Mbps upstream) and I frequently have quality problems (breaking voice or slow website upload) when using various web applications or soft clients. It may be my wireless router – which is integrated with the DSL modem. It may be my laptop RAM or processing power. It could also be an issue with my VPN, the size of my Lotus Notes mail box, or any other application I access on my laptop. It may be some cookies or software bugs on my home network. So it could be anything! But my point is, I am not ready to dump my TDM line OR my desktop phone for a PC-based soft client any time soon. Though my experience is that of a home worker, I think business environments are not immune to such challenges. If you really believe PC-based clients are ready to replace desktop phones, maybe you need to make sure the money you save from eliminating desktop phones is properly invested in assessing and upgrading LAN and WAN connections, PC processing power, RAM and hard drivers, etc. In my opinion, soft clients make a great adjunct to desktop phones, but not a viable replacement alternative … yet. SaaS and cloud-based communications enable convenient self service for SMBs and remote workers. COUNTERPOINT: I strongly believe in the value of hosted/cloud-based communications for businesses with limited in-house resources. But I have an issue with the claims around self service. I suppose, self service makes sense at the very initial stages of service selection and provisioning. Certainly, IP telephony – hosted or premises-based – also enables self-service moves, adds and changes (MACs), which provides substantial cost savings. IP telephony also enables IT managers as well as end users to manipulate settings through software/Web-based interfaces – providing flexibility and cost efficiencies. However, self service only goes so far. In fact, hosted IP telephony and other ASP services never gained much traction exactly because service providers were not able to provide sufficient network implementation and management support required for mission-critical, real-time communications. Inevitably, hosted services involve some customer premises equipment (CPE). To begin with, LAN and WAN reliability and security are top concerns with both hosted and premises-based IP communications. Therefore, router and switch selection, proper configuration and management are critical. Further, telephony endpoints and the respective wiring still require someone to literally crawl under people’s desks. Small business and remote workers should not be left entirely on their own when implementing or managing hosted IP communications. Most of the time, a remote worker, similar to a residential user, uses… well, “cloud” or hosted communications. The Internet service, the POTS line – it is all managed by a service provider. And remote workers frequently face some common challenges. For example, my intermittent Internet connection has been an issue for a while. Having to spend hours on the phone with a customer service rep and stick pins into the router to restart and reconfigure it could be immensely frustrating. My phone company, on the other hand, has so far left me without a phone service only once (for about 24 hours). But even that one time, the warning that if they come to my house and it turns out to be a problem with my internal wiring or phones, they’ll charge me whatever it is they charge, etc., etc. … well, it leaves a bitter after-taste. So, my point is, small business, remote workers, even medium and large businesses – they all want to feel taken care of. They’ll expect someone to come in and install or fix things for them as part of the monthly service charges and will not be too thrilled about self service. I hope my thoughts make sense. Let me know what you think. I have been working with the folks over at ImmersiFind on a mobile voip project for the past 8 months, the invite-only beta went live yesterday in the iTunes app store. It’s called “gabpark”. It’s been tested on the iPhone, iPod Touch and the iPad. In my humble opinion, it has some cool features that many should find quite useful. The service is free during the invite-only beta period. I have a few invites for bloggers who are interested in getting a sneak peak, just email erik AT sipthat.com. Gabpark is a new fun way to communicate with your family, friends and colleagues. Gabpark allows you to make and receive calls phone calls over 3G (Cellular Data Network) or WiFi. It works on both iPhone, iPod and iPad devices running OS 3 or higher. Never pay for roaming charges again! Turn your iPod Touch or iPad into a phone in just a couple of minutes! 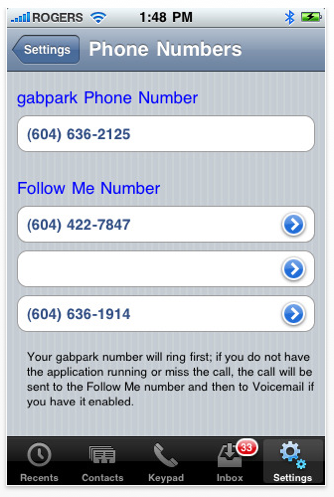 Use the Follow-me feature and gabpark will call up to 3 of your alternate numbers at the same time! Use your cellular phone, home and work numbers or any 3 numbers in North America! 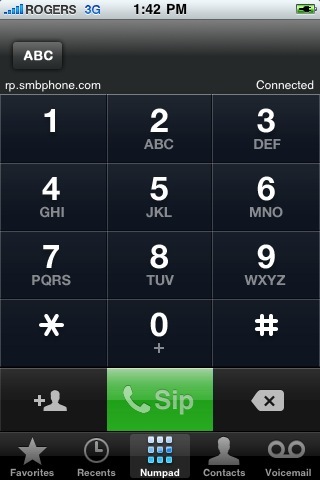 Gabpark Voicemail allows you to see and hear your voicemail without having to call in for messages! Share your voicemails with anyone! Change your Caller ID to match any of your existing numbers! Gabpark is currently available via invitation. Invite up to 50 of your friends right from the app so they can enjoy Gabpark FREE calling in North America! • Free calling in US and Canada! • Receive calls even when the gabpark app is not running. • Choose up to 3 follow-me numbers and gabpark will call them all at the same time. • Gabpark voicemail can be seen and heard right in the app. 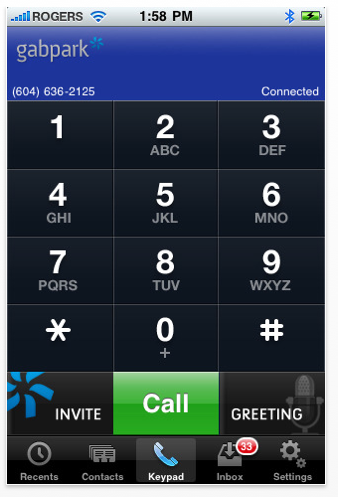 • Share voicemail with friends and family at the click of a button. 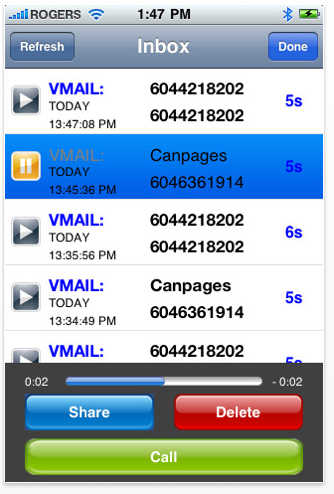 • Record up to 9 new voicemail greetings right from the app. • Record calls from any phone you receive a gabpark call on. • Blacklist. Add unwanted callers to your Blacklist and when they call your gabpark number they will hear a busy tone or a “This line has been disconnected..” message. • Integrated with your contacts. • Calls do not count towards your cellular calling plan. • Compatible with iPhone, iPhone 3GS, iPod Touch and iPad. • Built-in VoIP connection test. Because some mobile network operators may prohibit or restrict the use of VoIP (Voice over Internet Protocol) functionality over their network, such as the use of IP telephony over a cellular network, and may also impose additional fees, or other charges in connection with VoIP. As the user of this application, you agree to learn and abide by your cellular carrier’s network restrictions. Immersifind Inc. will not be held liable for any charges, fees or liability imposed by your carrier(s) for the use of VoIP over cellular networks. END USER MUST MAINTAIN AN ALTERNATE MEANS OF REQUESTING EMERGENCY SERVICES. END USER acknowledges and understands that COMPANY does NOT support traditional 911 and E911 access to emergency services. END USER must maintain an alternate means of accessing traditional emergency response services.